Start by making the black bean mash. Add the beans to a saucepan over medium heat and warm throughout. Add the mayonnaise, 1/4 cup warm water, green onions and cumin. Stir to combine and let simmer for a few minutes. Continuing stirring/mashing with a wooden spoon to yield a coarse mash. Once ready, remove from heat and set aside. Place the tortillas on a baking sheet and heat for 6-8 minutes until crispy. If you're adding cheese, throw it on top just before the tortillas are ready to come out of the oven, so it melts. While the tortillas are crisping, fry your eggs in a dash of olive oil. 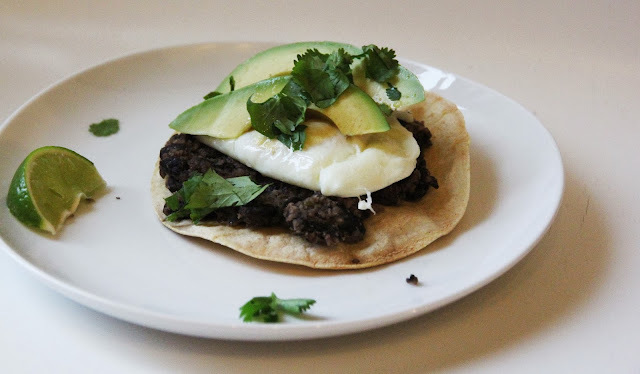 To assemble, top the tortilla with 1/4 cup black bean mash, an egg, 2 slices of avocado, cilantro and a squeeze of lime. *Note: These tostadas are jam packed with goodness, making them deceivingly filling. I was fully satisfied with 1, the boys wanted 2...adjust accordingly.